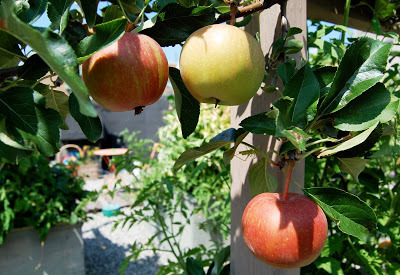 Where do you go when you’ve used all the space in your garden and in front of your house? You take it to the office and up the elevator. 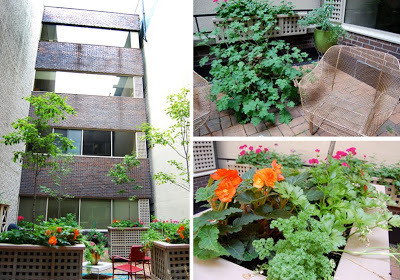 Gardener and artist Vivian Reiss has transformed two spaces in her office building on Merton Street into garden paradises in the middle of the urban jungle. The first of Vivian’s transformations was a dismal courtyard in an office tower canyon. There were chairs, but who wanted to go out there? It wasn’t terribly inviting. 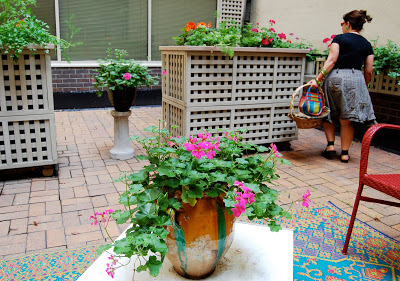 Now, as Vivian says, “It makes you smile.” Vivian outfitted the space with retro garden furnishings and simple rectangular planters with grid fronts. She planted with the hot dayglo colours of geraniums and begonias to make a warm, inviting space. 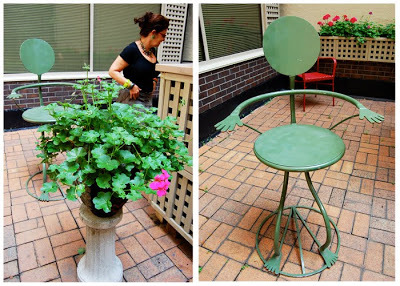 Little elements like a one of a kind pot sitting on a mismatched pedestal give the courtyard a funky touch, not to mention the metal “arm-chair” with actual arms from the 80’s. Re-using bits from here and there is Vivian’s specialty, to make something memorable and unique. And now up to the roof to see the vegetable garden aerie. This roof space is a full size vegetable garden, built inside massive planters, complete with an irrigation system. Watering would be almost impossible otherwise. Vegetables thrive with the hot, unshaded sun they receive all day. 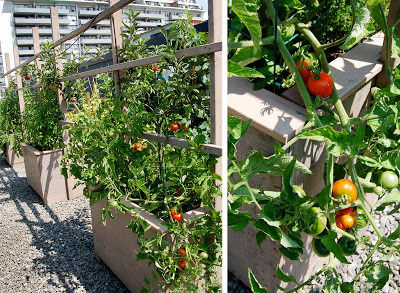 Tomatoes, beans, corn—bonus: no raccoons to worry about up here!— everbearing strawberries and even espaliered apple trees are thriving amidst a backdrop of office towers. I sampled a strawberry, and it was divine. “It just makes me happy to be here,” Vivian said, smiling. 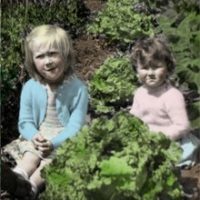 It’s her garden baby-and it’s a bouncing and delightful one at that! Today Vivian is hosting an heirloom tomato tasting event on her roof garden. I’m happy to be going to taste the bounty. Oh, you lucky duck, Sarah. Be sure to take notes at the tasting. So far, 'Black Krim' in my commt'y garden has really lived up to positive billing (at least, the one I got to taste before heading off to Iceland.) I look forward to your heirloom tomato tasting review! This post makes me want to rush out and claim some gardening space on a local office rooftop here in Prince George. Black krim is my favourite heirloom tomato. I'm growing 2 Black Krim plant in my greenhouse. Helen I'm sure Iceland is great. when is the race? I drove by a beautiful rooftop garden in Vancouver yesterday! What a fantastic use of space! And the sun! Well you can't get better than a full sun garden for the veggies! It's a good thing they have an irrigation system! Those do look like yummy strawberries! 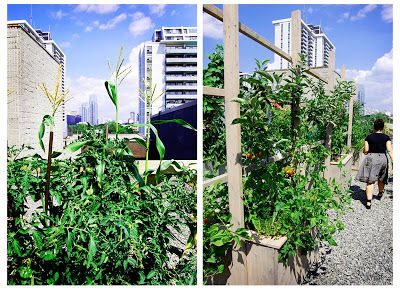 Rooftop gardens are becoming more popular and it is a great place to go green. I love that chair, like you said, a funky touch to the garden space.I posted twice on garden furnishing and seating this week. I wish my garden walks lead to such a cute find. I love it! 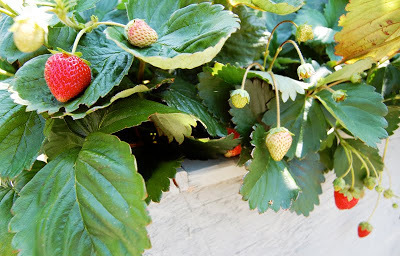 We have friends in the Shushwap area of BC who planted a green roof of strawberries. I think roof top gardening is brilliant!